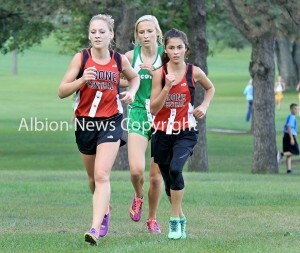 Cardinal runners took Friday’s Boone Central Individual Invitational personally. As in, personal-best performances. Led by Ashlynn Baker and Christina Stopak, Boone Central/Newman Grove runners recorded a large number of personal-best times – efforts that impressed veteran Cardinal Coach Tom Dickey. “I was more than pleased with our effort and results in the Individual Invite,” Dickey praised. “The kids recorded a total of 19 personal records! We saw some kids really step up their game – especially Christina Stopak, who gave our winner Ashlynn Baker everything she could handle! “I’m just really impressed by these kids and their desire to achieve greater things. I’m very hopeful we can get everyone healed up in the next couple weeks, so we can finish out this season really strongly. Baker won her second straight gold medal Friday with a personal-best time of 20:02, just ahead of Stopak, who clocked her personal best of 20:03.